On June 12, playwright and author Eve Ensler introduced Naomi Klein at the launch of her new book No Is Not Enough: Resisting Trump’s Shock Politics and Winning the World We Need at the Great Hall at Cooper Union. Here is the text of her introduction. It’s such an honor and joy to introduce Naomi Klein, radiant visionary, thinker, and writer, a powerful movement leader, a sister in the struggle, and a dear friend. Before I get to that, I need to take a minute to recognize Anthony Arnove and Haymarket Books. Anthony doesn’t know I am doing this, and I know it will surely embarrass him, but it is impossible to introduce Naomi’s new book without talking about Haymarket. Their coming together, as Jeremy Scahill said, is a marriage made in radical heaven. As most of you know, Haymarket Books—going on sixteen years old—is a gathering of great minds, artists, visionaries, activists, and radicals struggling in the same progressive direction. It is exactly the publishing force we need now in a world where the commercial publishing industry is still terrified to push the necessary political boundaries and often acts to block much-needed revolutionary thought. I need to take a moment to honor and celebrate Anthony Arnove, who has been publishing the likes of Noam Chomsky, Arundhati Roy, Angela Y. Davis, Howard Zinn, Wallace Shawn, Winona LaDuke, Keeanga-Yamahtta Taylor, and many more. He has edited, nurtured, and nourished some of our most important progressive writers and done it all with profound humility, brilliance, and the deepest generosity. Now Naomi has joined forces with Haymarket and grown and strengthened this field of visionaries. Congratulations in every direction. I have probably spent way too much time preparing this introduction to Naomi and her new powerful and essential book, No Is Not Enough. Maybe it’s the urgency of this moment, or the devastation of it, or the normalization of all that is fascist and hateful and misogynist and destructive of people and the earth. Maybe it’s knowing the kind of impact books can have when they are read—and that introductions can open the door, set the stage, enhance the significance. So, I was going to begin by reminding you of the array of brilliant books Naomi has already written: No Logo, The Shock Doctrine, This Changes Everything—books that became immediate international bestsellers because they offered radical new frames and ways of seeing the current world, and these frames were equivalent to rewriting the pattern of our brains. How often do I hear someone say in conversation, “Yes, well that is the shock doctrine at work”? I think of branding, neoliberalism, shock. The connection of capitalism and climate change. These books allowed masses of people to feel that maybe they might not be bulldozed by the epic proportions and distortions of a world gone mad, but in fact through Naomi’s interventions they could grab hold of the systemic fallout with organizing principles that could not only bring on understanding—interventions that could and did catalyze community and resistance. No Logo became the anthem of the anti-corporate, anti-globalization movement. Shock Doctrine gave form and validation to what oppressed people felt everywhere. Naomi’s boldness in identifying that the shock doctrine was not accidental but intentional gave permission to the outrage already present in many corners of the world and was at the heart of Occupy Wall Street. This Changes Everything took the climate change movement to more layered, nuanced, intersectional, and exponential heights. Then I was going to talk about Naomi’s extraordinary mind, which has a particular way of seeing, identifying emerging patterns, and synthesizing fragmented givens into coherent constructs and systems. She’s like a palm reader of the modern capitalist world, feeling her way across the landscape of what is broken, making bold jumps in perception. She has actually carved out her own category of writing that is a combination of extraordinary research, philosophy, journalism, and economics. (I mean, how many of us stopped fearing learning about economics because of her?) And great lawyering, as she is constantly digging down to prove and enlarge her cases. I was going to even go further and talk about what I might coin as her movement mind, a radical intelligence informed and directed by urgency and a love for humanity and the future of the planet. And this book, above all her other books, is compelled by the depth of her concern for our future and her knowing that we must come out of our silos to build the movement of movements capable of resisting this predatory mindset, but more importantly capable of imagining and building the world we want. Even the pace at which she wrote this book is an indication of her passion and love of us and this world. I was going to do all those things but I’ve decided to do what Naomi does in this book: keep it short and speak right to the point. No Is Not Enough is essential reading for anyone serious about resisting the current regime and building the new world. It’s our book and should be read by everyone. It’s a handbook, a guidebook, a manifesto, a driver’s manual, a radical diagnosis, a movement bible, a point of departure. It’s a warning. It’s prophetic and its deeply hopeful. As far as I’m concerned, we all need to agree on the basics of what we are fighting for and what we are going to do to get there. Naomi listened to a lot of us, and she has generously laid out the basis of a plan. Of course, we can add and embellish, but I think her diagnosis in this book of how we got here and where we are is unparalleled. Using this as a guide, as a point of agreement, perhaps together we can now figure out the exact details and vision of the future we want. We are blessed to have Naomi Klein living, writing, and thinking in our time—as a movement mind, as a mind always moving, restlessly, generously toward what is just, what is fair, what is free. I give you my sister, our sister, our beloved Naomi Klein. 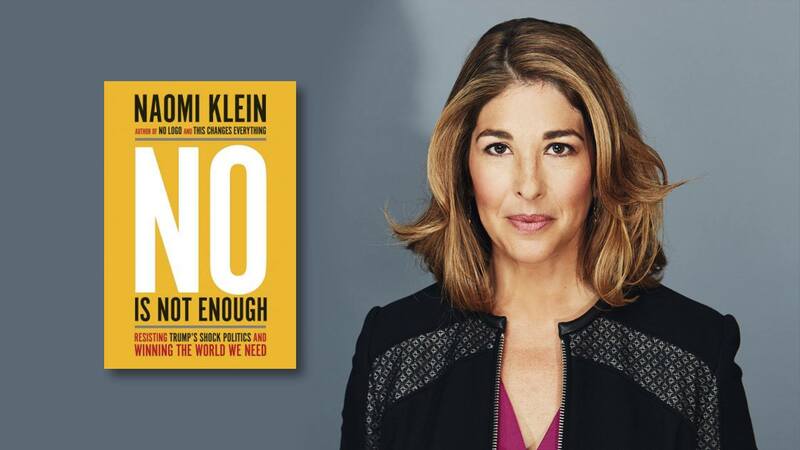 Take 40% OFF Naomi Klein's new book, No Is Not Enough. Each paperback purchase also includes a free bundled e-book.